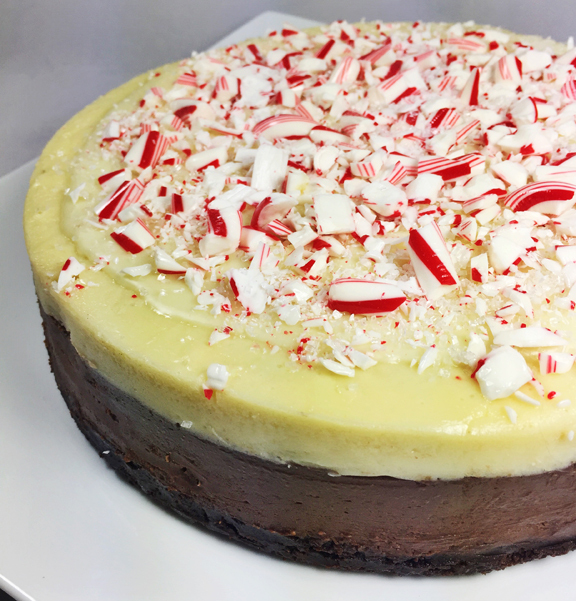 Whether you and your holiday guests are Peppermint Bark fans, or not, everyone will enjoy this fantastic dessert – two-layers of cheesecake, one dark chocolate and one white chocolate topped with peppermint candy. Our recipe starts with a chocolate cookie crumb bottom topped with a layer of dark chocolate cheesecake. Next, a white chocolate cheesecake layer is added, and the cake is finished with a white chocolate ganache topping sprinkled with crushed candy canes. To ensure a smooth, creamy texture for your cheesecake, have the cream cheese and eggs at room temperature. Additionally, this recipe uses a water bath (Bain Marie) technique to bake the cheesecake. This gentle method prevents your cheesecake from cracking in the center. Be sure to carefully wrap the springform pan with three pieces of heavy-duty foil to prevent the water from leaking into your cheesecake. Preheat oven to 325°F. Butter 9-inch-diameter springform pan. Add a round piece of parchment to the bottom of the pan; butter the parchment. Place the cookies in a food processor and grind until finely ground, Add the sugar and a pinch of salt and process until combined. Add the melted butter and process until well blended. Press crumbs evenly onto bottom only of the prepared pan. Bake just until set, about 8 minutes. Cool, leaving the oven on. When cooled, wrap the outside of the pan carefully using three layers of heavy-duty foil and be sure to keep the foil tight to prevent the water from leaking into your cheesecake. Place in a large roasting pan. Stir chopped chocolate in metal bowl set over a saucepan of simmering water until melted and smooth. Do not let the bowl touch the water. Remove and cool chocolate until just lukewarm. Meanwhile, In a stand mixer fitted with a paddle, beat the cream cheese, sugar, flour, and cocoa powder until smooth. Add in the eggs one at a time, mixing well after each addition. Add the peppermint extract, mix in well, then add the chocolate and completely combine. Pour the filling over the crust; smooth the top. Add hot water to the roasting pan about halfway up the side of the springform pan. Place in the oven and bake the chocolate layer until the center is just softly set and starting to puff around the edges, about 50 minutes. Remove from the oven and cool in the pan for 5 minutes. While the chocolate layer bakes, make the white chocolate layer. 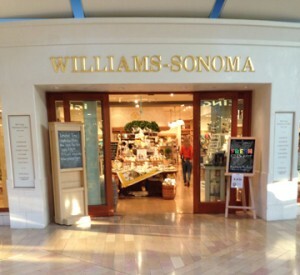 Stir chopped white chocolate in metal bowl set over a saucepan of simmering water until melted and smooth. Remove the bowl and cool the chocolate slightly. In a stand mixer fitted with a paddle, beat the cream cheese, sugar, and flour until smooth. Add the egg and mix well. Add the peppermint extract, then add the melted white chocolate and mix until well combined. Starting at the edges, carefully spoon the white chocolate batter over the warm dark chocolate cheesecake; smooth the top. Place back in the oven and bake until the white chocolate filling is set in the center, about 30 minutes. When set, turn the oven off, open the door to release some heat, then leave in the oven one hour. Remove from the oven and carefully lift out of the water bath; remove the foil. Cool 15 minutes then run a thin knife around sides of cake to loosen from the pan. Cool completely in the springform pan, cover and chill overnight in the refrigerator. In a small saucepan over low heat, heat the cream to a simmer, stirring frequently. Meanwhile, place the finely chopped white chocolate in small bowl set over warm water on low heat. Stir often until melted. Remove from the heat and stir until smooth. Add two-thirds of hot cream to melted white chocolate and gently stir to incorporate and then whisk until smooth. Gradually stir in remaining cream. Pour immediately into the center of the cheesecake, spreading into a smooth circle about ½” from the edge all the way around. Immediately top with the crushed candy cane pieces, pressing them into the white chocolate ganache. Chill in the refrigerator until the ganache is set. Release the springform pan and remove the outer ring. Transfer cheesecake to platter. Let stand 2 hours at room temperature before serving. Makes 16 servings. 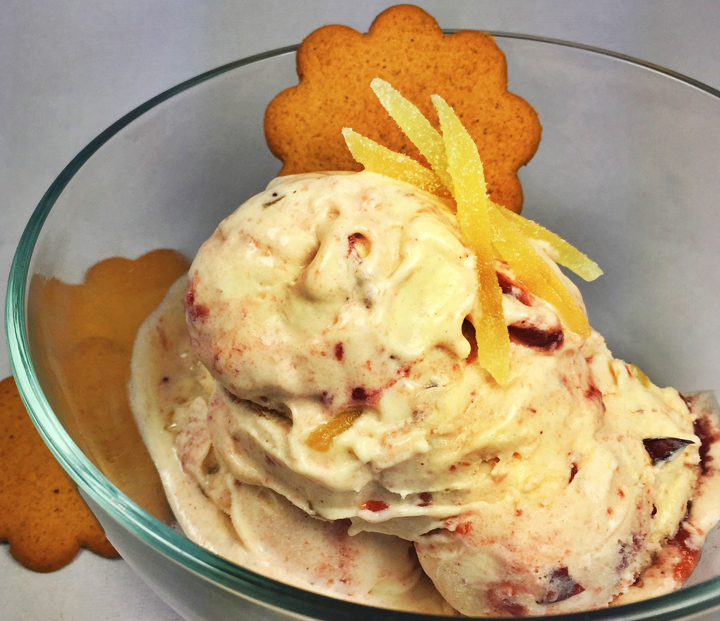 A perfect holiday treat – ginger infused gelato accented with a cranberry sauce swirl. We whisked leftover Thanksgiving cranberry sauce with maple syrup and added it with bits of candied ginger to give this cool treat some spicy heat. In a heavy bottom saucepan, combine the milk, cream, fresh ginger, and salt. Place over medium-low heat and cook, stirring occasionally until bubbles start to form around the edges and the mixture reaches 170 degrees. Remove from the heat, cover, and set aside to infuse the ginger for one-two hours. Pour the milk/cream mixture through a fine-mesh sieve to strain out the ginger pieces, pressing on the ginger to extract all the liquid. Return the strained liquid to the pan and reheat to 170 degrees. In a bowl, whisk the eggs until smooth. Gradually add the sugar and whisk until the mixture is thick and pale yellow and the sugar had dissolved into the eggs. Temper the eggs by slowly adding the hot milk/cream while whisking constantly. Return the mixture to the pan and cook over low heat, stirring constantly with a wooden spoon, until the mixture is thick enough to coat the back of the spoon and it reaches 185 degrees. Do not boil. Fill a large bowl with ice. Place a medium bowl in the center of the ice. Pour the mixture through a fine mesh strainer into the clean bowl set over the ice and cool completely, stirring occasionally. When cooled, cover, and refrigerate overnight. The next day in a small bowl whisk the cranberry sauce with the maple syrup. Set aside. Pour the custard into an ice cream maker and freeze according to manufacturer’s instructions. During the remaining 5 minutes of freezing, add the chopped ginger. During the last 30 seconds, add half the cranberry sauce mixture. Transfer the ice cream to a freezer-safe container, layering with the remaining cranberry sauce, and place in the freezer for at least four hours before serving. Makes 8 servings. 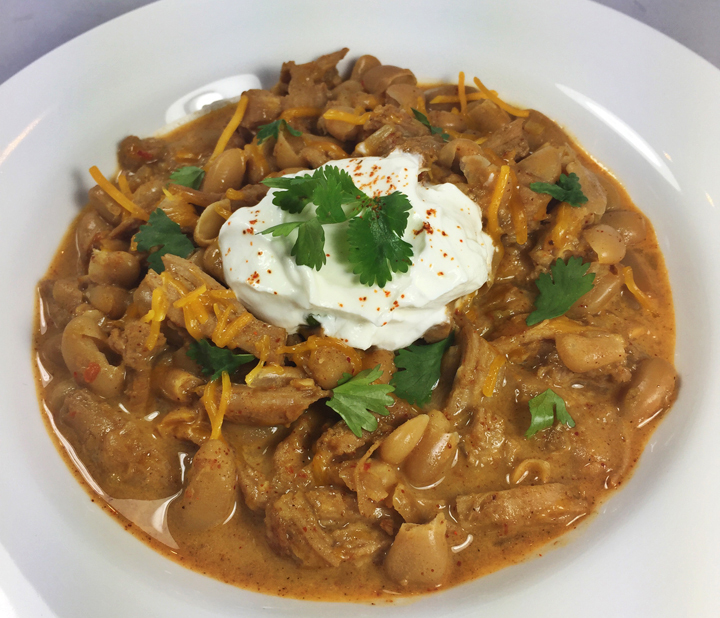 Our Spicy Turkey Chili will change your mind about Thanksgiving leftovers. Seasoned with three chilies and smoky cumin, it’s the perfect leftover-makeover dish. To match up with the chili’s heat and keep the flavor, we melt in cheddar cheese and sour cream right before serving. Top it with scallions, cilantro leaves and more sour cream and cheddar for a deliciously comforting dish on a cold day. In a large pot heat the olive oil. Sauté onion and garlic over medium heat for 5 minutes or until tender. Add shredded turkey, beans, chili powders, cumin, oregano, salt, cayenne, and green chilies. Add 2 cups of unsalted stock. Stir to combine and simmer, covered, on low for 2 hours. Stir in the cheese and sour cream. Bring the pot back to a gentle simmer watching carefully to prevent the chili from boiling. Simmer the chili for 15-20 minutes, adjusting with additional stock to achieve the right thickness. Serve in warmed bowls with garnishes on the side for topping. Makes six servings. We took an old Irish Potato Bread recipe and turned leftover Thanksgiving mashed potatoes into a delicious quick bread. 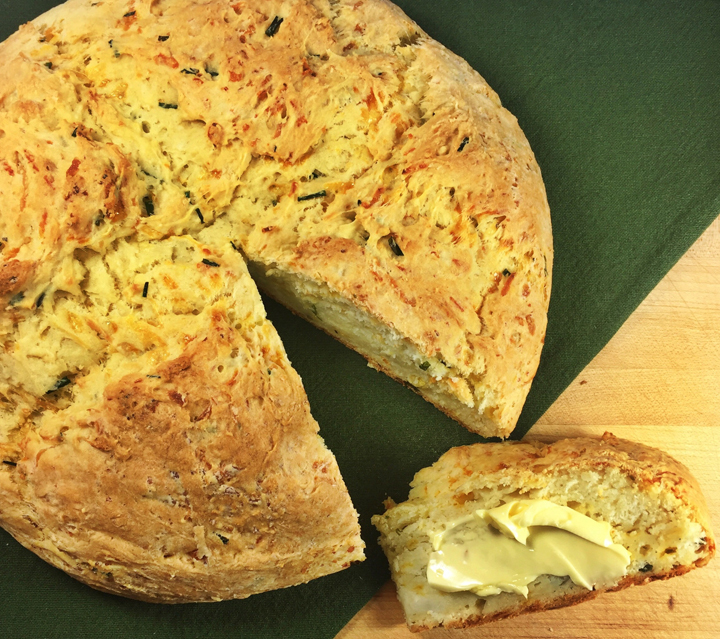 Using no yeast, this tasty bread rises to the occasion with baking powder and is filled with cheddar cheese, fresh chives, and grated potatoes. Preheat the oven to 375 degrees and position a rack in the center of the oven. Line a baking sheet with parchment paper. Place the mashed potatoes in a large bowl. Peel the raw potato and grate it through the large holes of a box grater. Place the grated potatoes in a clean kitchen towel and wring tightly to squeeze out any excess moisture; add to the mashed potatoes. Stir in the egg, egg white, butter, milk, chives, and cheddar cheese until well combined. In a medium bowl, whisk together the flour, baking powder, and salt. Add in three batches to the potato mixture, stirring well with a wooden spoon after each addition until the mixture forms soft, but sticky dough. Lightly flour a clean work surface. Turn the dough out onto the floured surface and knead for 60 seconds, adding flour in small increments to keep the dough from being too sticky. Shape into an 8-inch loaf, and place on the prepared parchment lined baking sheet. Use a sharp knife, slash a ½” deep X in the top of the dough. Place in the oven and bake until golden brown, firm, and somewhat hollow sounding when tapped, about 60-65 minutes. Remove from the oven and using the parchment, move the bread to a cooling rack. Slide the parchment out from under the bread and cool for one-two hours on a wire rack before slicing. Serve warm with butter. Makes one loaf, about 12 servings.